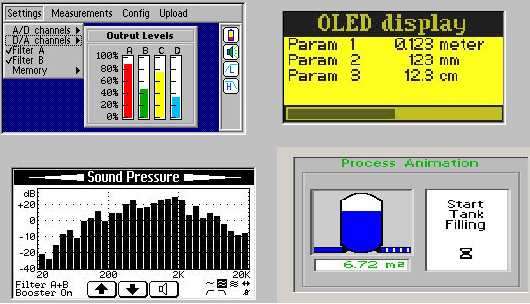 Ramtex's GUI C source libraries provide a powerful and flexible Graphical User Interface for embedded applications.All the LCD, TFT and OLED driver libraries implement a basic high-level function interface, in which the functionality of Color / Grey-level libraries is a true superset of the functionality of B&W libraries. All libraries are supplied as processor-independent Standard-C conforming source code. Just use a C, C++, or EC++ standard-conforming compiler for the embedded processor.Save weeks of programming by using the Graphic display driver libraries with your next embedded processor project. About our LCD/OLED Display modules..